NEC 314.16(C)(2) allows for splices and connections to be made in a conduit body. 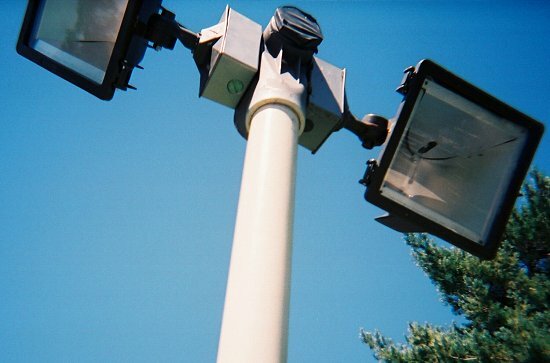 An apartment complex, desiring some parking lot lights, used 2" SLB's as a means for mounting the lights. This was done by drilling and attaching the fixtures to the sides of the bodies. Of course, LB's have two openings...see how the extra opening has been covered with tape? FWIW, there exists an "E" body, which has only one opening- though getting one this large is a problem. Or, perhaps a "tee" body could have been used, with reducers. the other thing it do get my attetion with quatz halogen lights the T-3 or T-4 bulbs are not designed as to run off axis of horzontail due the heat build up and it will cause early bulb failure there. You would think that someone who spent that much time chopping this thing together would have sprung a couple of extra bucks for an actual plug for the LB. I also thought it was against code to use fittings for uses other their intended purpose. Or is that the warning on spray cans? I haven't had any coffee yet. Rad...that's an interesting point....some would also object to the use of 2" RMC as the light pole, for the same reason. I don't know how far you can go with that logic...looking at various standards, they are a lot less specific for something like an LB (for which the final use is unknown) than they are for, say, a mig welder. FrenchE, I didn't know that...one of the problems with this installation is that the conduit nuts don't do a very good job of securing the light in the direction they want to point it.